Summer Circle Time Plans and Goodies for You! We've begun our summer Circle Time because our spring Circle Time was kinda lame. That's the way it goes, you know? Not everything can be a success, and not every Circle Time season will be stellar. Cut yourself some slack, mama. Summer Circle Time here is mellow and fun and totally focused on our spiritual growth, our relationships, and some projects or topics we haven't gotten to the rest of the school year. Landmark cards, purchased from National Geographic and also available in the Dollar Spot at Target during back to school sales. Ours are similar to these from Rand McNally. 10 verses we're memorizing this summer. 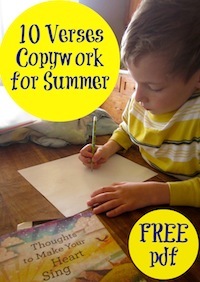 I created simple copy work pages for these and you are welcome to download and print them out for your kiddos, too. At the very beginning of our Circle Time, post breakfast (dishes have been cleared but kitchen not yet cleaned), I read the day's page from Thoughts to Make Your Heart Sing. It's very short, and perfect for the gnat-like attention spans of Christian (6) and Joe (very young 5). I am surprised by my kids' choice with the On This Day Devotional, which I believe is really written for adults. Annesley (9) begs to read it each day, and even though it often covers martyrdom, they really like the stories of faithful Christians who came before us. Christian and Joe don't really care. Everyone loves the landmark cards, and they compete over the answers. I let the little ones guess first because the oldest one in our Circle Time (Abby, almost 14) knows them all. If the littlest doesn't know a card, I move up the ages until someone answers. It's automatic review that way. Finally, we review the week's verse. On Mondays they do the copy work page and then they work on their verse for the rest of the week. I made simple index cards for them to track their verses and get a sticker next to each one when they've memorized it. Even the 14-year-old knows this is simply a way to mark them off, and she's not bothered by the sticker. Might be personality thing, though. I did tell them that once they've memorized all 10, there will be a reward. Haven't decided what yet . . .
Click the above photo to get your free pdf of our 10 Verses Copy Work for Summer!